Here at LFGdating our middle name should be Responsive. Whether it’s our out of this world customer service straight from the founders, or our sleek, modern, and 100% responsive HTML5 web design, Casey and I are honestly considering dropping Thomas and Evan (I’ll let you figure out who’s is who’s) and plugging in Responsive. Okay, so I lied – we’ve already done it, but you get my point. Now that I’ve got you hooked, let’s talk mobile, and show you just how responsive LFGdating can be on literally any device you can throw at it. So what is a responsive web design? A responsive web design, like the one you’ve likely already enjoyed on our main site, or even here on our Gamer Dating Blog, is a design that actually fluidly adapts in real-time to whatever device or screen size you can get your paws on. Want a great example? If you’re on your laptop or desktop computer the easiest way is to grab the browser window you’re reading this in – hold on, let me buckle my seat belt – and slowly collapse the width down. As the width is reduced, LFGdating quickly and elegantly adapts and rearranges the content to fit the new environment, all without loading a new page or tearing a hole in the fabric of the space-time continuum. Once you get about half-way you’ll get a perfect look at the tablet/phablet version for LFG, and should you narrow your browser down to it’s smallest setting width-wise, ta-da, you’ve got our mobile phone version! No new page loads, no different websites altogether, just a modern and simple gamer dating experience for everyone that chooses to raise their LFG flag (and there are a LOT). Oh, but there’s more. Do you want to unlock the LFGdating Mobile App Achievement? 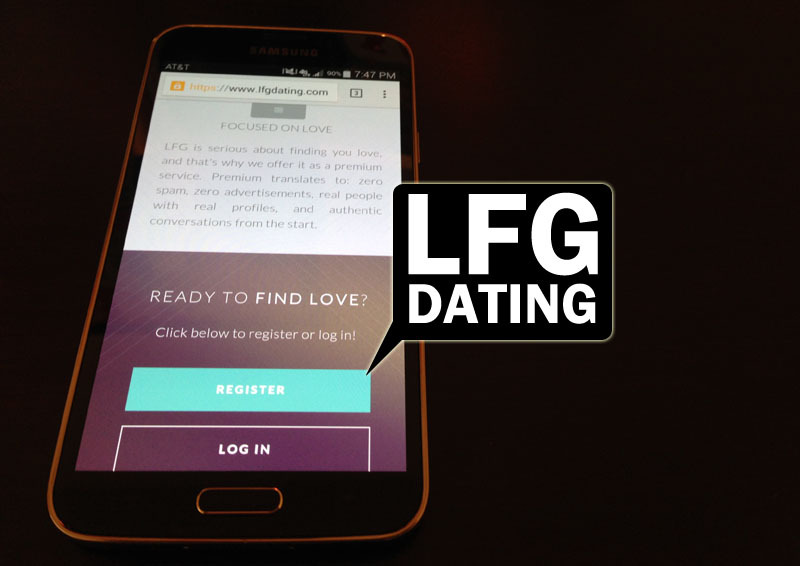 While we have had a ton of happy users asking if we had an iOS or Android app (and we actually did – it’s just being revamped right now), LFGdating is already an app if you follow these quick and super simple steps. First, bookmark LFGdating in your browser of choice, then simply elect to save the bookmark as a desktop icon on your iOS or Android device, and you’ll see our icon pop up among your other apps. Can you notice a difference? I can’t, and now you can take LFGdating anywhere! Well, almost anywhere – you’re going to need a cell phone or WiFi signal, so let’s be realistic. So there you have it. I think we’re all sick of landing on a website on our iPhone, only to have to zoom in and out, scroll this way and that, only to get irritated and say something we’re all going to regret. 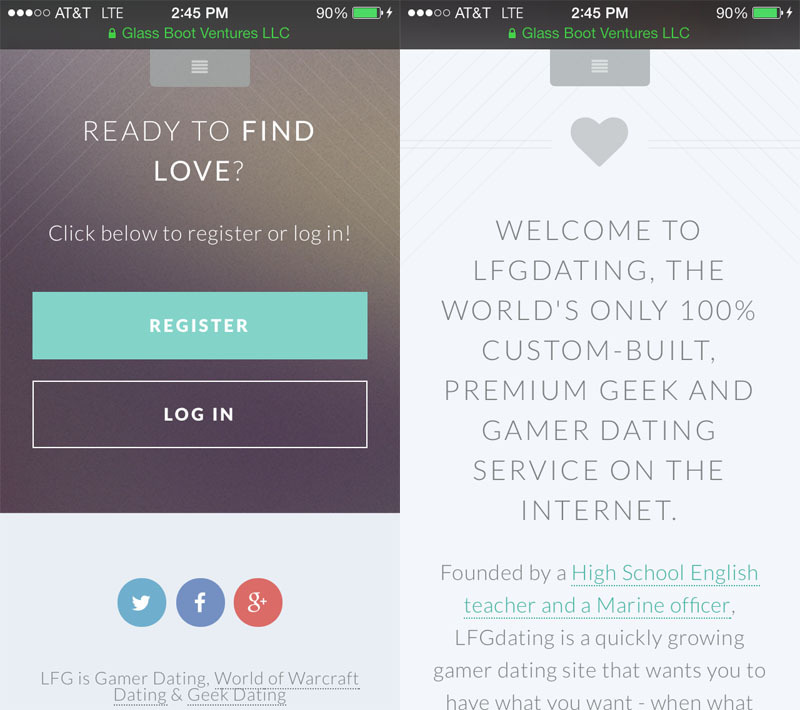 LFGdating is the modern, elegant, and super simple dating service that geeks and gamers deserved years ago, but with tens of thousands of users already in the ranks, there’s not a better time to join. Welcome to LFGdating, and enjoy your stay!